Industrial supply companies have been rallying recently, but did the results from the latest supplier justify the optimism? 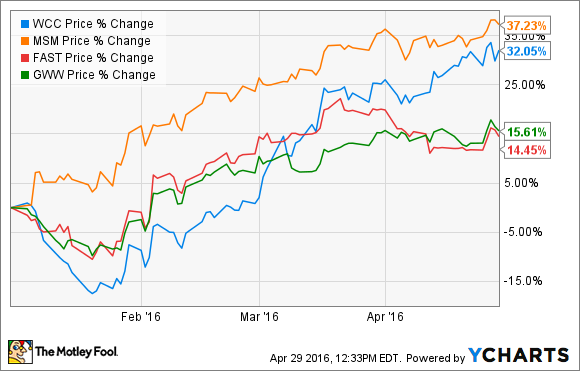 The first quarter was never going to be a pretty one for Wesco International (NYSE:WCC). Compared to other industrial suppliers like MSC Industrial Direct, Wesco has a lot of exposure to the kind of heavy industrial activities (metals, mining, energy) that have suffered the most in the recent slowdown. However, given the startling recovery in industrial supply company stock prices in 2016, the market is clearly preparing for a turnaround in conditions. Let's take a look at the facts behind Wesco's first quarter to shed more light on the matter. Sales of $1.776 billion were down 2%, and came in slightly above the midpoint of guidance for a 4% to 1% decline. Operating margin of 3.9% came in toward the low end of previous guidance for 3.8% to 4.1%. The effective tax rate of 31.9% was higher than guidance for around 30%. Full-year sales growth expected to be flat to negative 5%. Full-year operating margin expected to be in the range of 4.8% to 5%. Full-year EPS in the range of $3.75 to $4.20, and free cash flow from net income conversion of above 90%. Given that the first-quarter results were in line with expectations, it's no surprise to see the full-year guidance maintained. However, this may prove to be a conservative estimate. For example, sales guidance growth for the second quarter for a range of negative 3% to negative 1% implies that the growth in each of the first two quarters (negative 2% in both cases) would be above the midpoint of the full-year sales guidance for a 2.5% decline. Overall organic growth declined 6.7% in the quarter, a result only slightly better than the 7.6% decline in the fourth quarter of 2015. It looks like small potatoes, but recall that investors are looking for signs of stabilization. To best gauge prospects, and compare with companies like MSC Industrial or Fastenal, it's a good idea to break out Wesco's growth by end market. The following chart spans the last six quarters for the company and clearly demonstrates the extent of the slowdown. However, the chart only tells you part of the story. In reality, the industrial end markets' decline is being led by "oil and gas, metals and mining and OEM customers." For example, oil and gas sales declined 25%, and despite that hefty drop, still represent 7% of Wesco's total business. The construction growth figures are startling, not least because this is one of the stronger sectors in the industrial economy. Indeed, MSC Industrial's non-manufacturing sales (large construction exposure) saw growth recover in the quarter. However, CFO Ken Parks outlined that "as with most of last year, the decline was driven by industrial-oriented contractors in the U.S. and Canada while our sales to commercial contractors were up low single digits," and went on to conclude that expectations "for segments of the non-residential construction market including commercial, educational and healthcare remain modestly positive." Clearly, Wesco's oil and gas and metals and mining exposure is also hurting its construction sales. Moreover, CEO John Engel's commentary on nonresidential construction prospects was hardly a ringing endorsement of the idea that the market would come back strongly in 2016: "There's a series of data points out there too that would suggest that non-RESI is not going to really inflect up this year and that it could be kind of flattish or down slightly." The utility and CIG end markets had a rather better performance. Excluding foreign currency movements, both reported slightly positive (0.6% and 0.4%, respectively) organic sales growth. Management sees the utility sector as "in a consolidation phase" with "flattish to very low single-digit growth prospects." As the energy and commodity markets have suffered, so has Wesco. But with prices of various commodities rising recently and the market taking a more positive view on matters, there may yet be some upside to Wesco's guidance for 2016. All told, Wesco needs to see some stabilization in its heavy-industry end markets, and growth in the nonresidential construction market, before its numbers will get tangibly better.